During one of the Heart of the Matter Online Homeschool conferences I had the pleasure of hearing Joyce Herzog speak on Special Needs and Homeschooling. Since we're friends on Facebook I saw that she needed people to evaluate and review the two of her books - Joyce Herzog's Guide to Choosing and Using Curriculum - and the Companion resource ebook with links - I jumped at the chance. 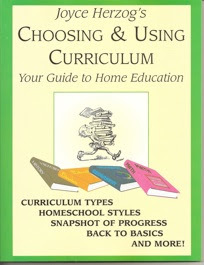 The Guide to Choosing and Using Curriculum is in print form and the companion book with links is in ebook format. just always have and have loved it. I found it very hard to try and teach a child who has dyslexia and processing issues. I soon realized that I didn't even know phonics! than it was coming to terms with their special needs! Introduction/Chapter 1 - Love the questions to ask yourself when evaluating a curriculum as well as tips for convention attending. I hope to attend an in person next year because I love the online conventions. (The Fall Heart of the Matter Online Conference starts Monday and there is still time to get a ticket.) There are questions to ask a curriculum writer that will help you decide if their curriculum is right for your kids. Chapter Two - Curriculum Types and Comments - I love the way each method is broken down with the advantages/disadvantages and the consideration for the special needs learner. I found the most valuable parts were the suggestions on how to maximize each approach to work with special needs kids fir each homeschooling method. If you tend to collect curriculum like me or by necessity do the eclectic thing this helps a great deal to use what you do have. As she states several times - there is no one size fits all curriculum for ADHD or Autism or Dyslexia. We must find ways to modify and tailor the curriculum to what our kids need. I had no idea where to start but this book gives me places to start and ideas to use. Chapter 3 - Which One is Me? - This has descriptions of different types of homeschoolers. I found these descriptions very accurate - sometimes uncomfortably so! I go from 'Average Homeschooler' to 'I don't know what to do with Johnny' several times during a school year. leave our boys in it. It's been a constant state of trying to catch up as they refused to recognize our oldest's dyslexia. The suggestions and tips are very helpful because after five years I still feel inadequate to the task before me. Yet, I know God doesn't call the equipped - He equips the called. Chapter 4 - Education Styles - This chapter goes into how each Education Style actually looks in the homeschool. The subject she uses is the topic of ducks. The illustration was spot on and really helped me understand the different homeschool methods and how they are applied. Chapter 5 -Grade Levels - I found the history and explanations very helpful. It is very hard to get out of the idea that because a child is a certain chronological age then he/she should be at ____ grade level. Chapter 6 - Getting Back to Basics - This chapter talks about the very basic things we wish to teach our children. Chapter 7 - What Can They Do By Themselves? - A very nice list of tasks that a child should roughly be able to perform independently at certain age range. Since I don't have typical developing kids and I don't know what 'typical' development looks like I found this very helpful. Chapter 9 - Take a Snapshot of Your Child's Progress - So often progress is very slow and so hard won that we miss the achievements and focus on what we haven't gotten done. This chapter gives tips on how to see the trees for the forest. Chapter 11 - Bible, Spiritual, Religious and Character Training - A wide selection of links to materials and book suggestions that are available for this area of study. Chapter 12 - Points to Consider When Choosing a Math Curriculum - I skimmed this - as we found programs to fit each of the boys mathwise but I liked the questions to ask yourself when evaluating if a curriculum is a good fit for your child. Chapter 13 - Comparison of Math Programs - I really appreciate the side - by - side comparisons of programs through out this book. It really helps when you are trying to weigh your options. Chapter 14 - Points to Consider When Choosing a Reading Method - Again, a great list of things to question when deciding if a program will work for your individual child. Chapter 15 - Comparing Seven Popular Learn-to-Read Methods - The breakdown of the various learn to read methods is VERY helpful for the parent of struggling reader. I wish I had this break down back when I was wondering what could I possibly use to help oldest read and that I could effectively teach. Chapter 17- How to Interest a Child in Reading - This is one of those - 'Where have you been all my life' - chapters. I think coming to terms with having three kids who don't like to read was harder to come to terms with than their autism. I spent much of my childhood (and adulthood) with my nose in a book and to not be able to share that joy with my kids is hard. I had no idea what might spark an interest and now I have new things to try. Chapter 18 - Teaching Reading Comprehension - I found it very hard to teach this as it was something that came naturally to me my entire life. This provides me with a guide and methods to use. Chapter 19 - Teaching Discernment in Literature - Very timely chapter as my kids are getting older and need to be wise about what they are reading and what it is actually saying to them. Chapter 20 - Developing Written Expression - Writing is a nightmare here. I have used just about every program on the market. I was glad to see this chapter. Chapter 21 - Looking at Language Arts - A very informative list of what is out there for language arts. Chapter 22 - Comparison of Handwriting Styles - I skimmed this as we have used one particular program for years and it works well. Still - the side by side helps very much. Chapter 23 - A Few Unique Books to Consider - These are resources I had not heard of before but are now on my needs list. Chapter 24 - Geography, Science and History Resources - Lists the various programs available and a brief summary of each. Chapter 25 - Tips for Teaching History - This chapter is going to be copied, laminated and at my fingertips at all times during teaching history. The tips - the questions to provoke thought and discussion are very valuable and helpful. Chapter 26 - Adapting Materials for Special Situations - The most important chapter for me. So often I realize things need to be adapted but have no idea on how to proceed. I'm putting this in my teacher notebook because I need to go over it again and again. This is a list of ideas on modifying or adapting work for your child. There are so many of these that I felt like I should have thought of already and did not. This chapter is being copied and posted at my desk to remind me of how to change how to get information into the child when the current method isn't working. A few examples: Do half the problems. Read to your child if you need to do so, provide the child another way to demonstrate what he knows - a project, a film, an oral presentation, etc. Highlighting and other visual aids - mini offices for example. Chapter 27 - Testing - A chapter I skimmed. In NC we are required to administer a standardized test yearly. I use the CAT 5 and the only reason we do it is because it is legally required. The chapter does remind you to examine the point of the testing and what the testing can tell you or even if it is helpful. All of our kids had been evaluated before we started our homeschool journey - (except for the dyslexia) - and we found that the 'labels' helped us a great deal to understand why they do the things they do. Chapter 28 - Special Help for Our Very Special Students - These are specific suggestions for various special needs as well as resources for support or more information on each. I found the text very readable and the layout and illustrations very nice. The print copy is only 12 and it is a book I will refer to again and again. Disclaimer: I was given a copy of these two books by the author for the purpose of my honest and truthful review. I received no other compensation for this review and my opinions and thoughts are my own.